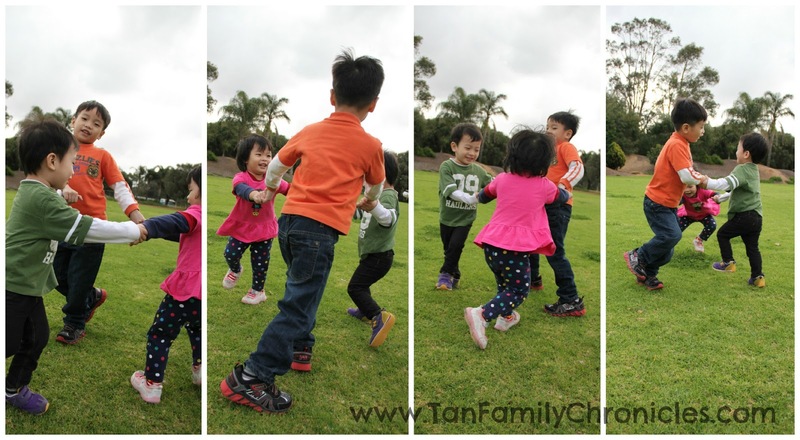 Tan Family Chronicles: Lucky to have someone to share with! You know how, when you have three kids, one of the things you HAVE to get them to learn - is how to share. Share share share. It's like a mantra. We repeat it all the time. The kids fight over it all the time. It goes on and on. But then, it is part and parcel of growing up. On good days, they share very well, give way to each other. We make sure that we single out such good behaviour and praise the kid for it. "That was very generous of you, Shawna, to let Kor Kor see your party hat the moment he asked for it. Thank you!" "Thank you Asher, for waiting quietly and patiently for your turn to read the book on sharks. That is very good behaviour. Thank you!" "That's nice, Isaac. I saw how you gave Asher some of your chocolate when he dropped his. Thank you for being a very good Kor Kor and taking care of your little brother like that. Asher and Shawna are so lucky to have you as their Kor Kor!" We have found that doing and saying all this goes a long way in encouraging the kids to behave well. Thus, thankfully, the kids have more good days than bad days. But sharing has always been particular tough. Short of buying every child the same item, there is no way of getting around it. Three sets of everything?! That's just a waste of money.So inevitably, one day, I heard Isaac say: "Why must I always share with Asher & Shawna?" Usually we'd give him the "Because they are your brother and sister." spiel. But I don't think he really buys that, and so now and then, he would still repeat his question in frustration. Asher, Asher, we all fall down! Isaac:" Mummy, you know this Morton, he very lucky you know, he says he doesn't -"
Mummy:" Oh, yah, Morton, he doesn't have to share his toys with anyone, is it? Mummy:" Yes, yes" I said in a very sad voice "So poor thing, isn't he?" Mummy: "Yah, so poor thing. He has no one to share his toys with... coz he has no brothers and sisters. Toys are more fun when you have someone to play them with, right?" Isaac nodded, still a bit stunned on why I said his best friend was "poor thing"
Mummy:"Yes, so you are very lucky Isaac, that you have Asher and Shawna. Because you have Asher and Shawna, you have someone to play with from the moment you wake up, right up to the minute you fall alseep at night. You three are always playing and having fun, all day! But Morton? So poor thing; he only has his toys to play with. But no one to play with him. So poor thing, right?" Mummy:"So, yes, he is lucky he doesn't need to share. But that is because he has no one to share with. You are lucky you have someone to share with, to play with, to laugh with, to have fun with. Isn't that great?" Isaac nodded, and was quiet, lost in his thoughts after that conversation. Since this exchange happen a few months ago, Isaac has not asked his "Why must I always share with Asher & Shawna?" question as much as he did before. And occasionally, he even turns to me and says:"Mummy, I am so lucky to have Asher and Shawna so that we can play together, right?" "Yes, Isaac, that's right :)"
I was talking to a friend of ours who is a trained psychologist. Her daughter used to be classmates with Isaac, and we had grown close over the years. Her reaction to this story:"Hahaha very good! You re-framed it! Well done!" Ah! I didn't know there was actually a clinical term for this! Cool! So this morning, I was really this excellent post on the Scissors Paper Stone Blog, and it reminded me that I had to write this post! :) Hop on over to read the post that prompted this post! Oh wait, first, I must put in my disclaimers. I am in no way passing any judgement on people who choose to have only one child... I was just trying to present the situation to Isaac in the best possible light for his own csituation... Besides, not everyone who has only one child has one child out of choice. And even if they do, I am sure they have their own reasons for it. Hey Pam, great perspective. I think sharing is harder for some kids but good to help them see the flip side.